Brandneue Luxusobjekt Wochenendhaus an der Ostfront des Glacier National Park. Spektakuläre Ausblicke mit 3 Hektar gepflegt Hof mit einem Walking / Jogging-Schleife. Diese Kabine wurde mit Komfort und Effizienz im Verstand errichtet. Strahlungswärme, Klimaanlage, und Spray-Schaum-Isolierung gewährleisten die höchste Qualität des Aufenthalts. Walnut Holzboden und Travertin Fliesen im Überfluss in diesem luxuriösen Urlaub. Eine voll ausgestattete Küche mit Service für vier ist immer willkommen. Newly renovated cabin was very nice and the bed super comfy. I wish there was storage for our clothes, but we made it work! This is the nicest place I stayed on my recent visit to Glacier National Park. The cabin is perfect for a couple. My only criticism is regarding communication. In the weeks leading up to the start of my reservation, I attempted to contact Jason regarding the fires in the park and if he had any flexibility in the cancellation policy. He did not respond. Don’t let that deter you from staying here. The cabin has a small front porch with porch furniture for sitting outside, a gas grill for grilling, a completely stock kitchen. It has a big screen TV with satellite (this is hard to come by in this area). The “town” of East Glacier isn’t much, I would suggest stocking up on groceries prior to arriving. I would definitely stay here again, and would recommend this cabin. Best part of staying here was the bed. FANTASTIC! Especially after long days exploring the park.....what a relief to have such comfy beds! Jason was so helpful with information and other items we needed. Great kitchen with spices and some condiments provided. Bathroom would have been more convenient if there was a counter. Great shower! Acceptable 2 room (1- bathroom and 2- living/kitchen/bedroom) rental. View is similar/same as any of the other local lodging options. Cabin porch looks over gravel parking lot and house next door with mountains in the distance. There are 3 other cabins immediately adjacent, using the same parking lot. If you're on the porch you can easily hear the conversations of your neighbors. This was fine for me because I did not need or want privacy for this trip. 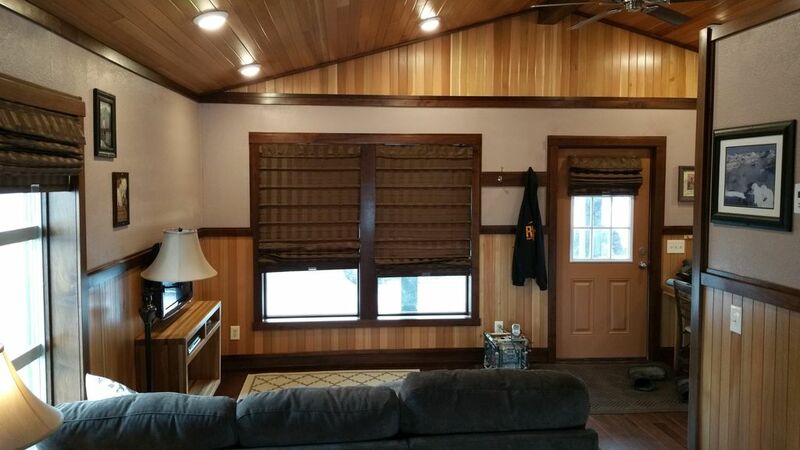 Cabin is dusty, particularly windowsills, floors near walls and ceiling fan. Kitchen utensils/dishes a bit sticky but easily cleaned with provided dish soap. local magazine(s) dated last year but did give a list of local events but for last summer. Room is <1/2 mile from gas station and local tourist shops, restaurants, post office and Amtrak are even closer. These were easily walkable and prices not as inflated as you'd expect. I did not eat out and can't comment on the local restaurants. The kitchen had everything I needed and things were in working order. I did not use the coffee maker. Furnishings are comfortable and clean. Shower stall has a bench, hot water and clean towels. Toilet paper provided next to toilet. Be sure to bring soaps and other bathroom amenities. Bed linens, mattress and pillows all very comfortable. Sleep was interrupted several times due to local train noise but I think this would be an issue anywhere in East Glacier Village. TV worked fine with many channels. Overall, this is a good choice if you are visiting Two Medicine, need a kitchen and do not plan to eat out. It's very easy to find and I liked being able to walk to the post office. My husband and I stayed in this cabin and it was perfect. The pictures in the current ad are not updated but similar feel for sure.. the bed is actually a king and there are four bar stools in the kitchen! Great updates and a wonderful surprise! :) The bed is extremely comfortable, and the shower is huge! The couch also pulls out to a bed. It would be cozy for 4 adults, but a good size for a small family. There are two other cabins for rent on the same property, and we had friends stay in the one next to us..which was also fun! The property owners were quick to respond and so helpful with any and all needs. Cute shops in walking distance and a few restaurants, as well. Easy drive to Two Medicine and Many Glacier. We didn’t visit other parts of GNP due to the fires. Had a wonderful time and would stay again! We stayed in Number 3 which is a beautiful little cabin. Brand new and spotless. Small but full kitchen if you plan to cook. We only stayed two nights so we ate out. Bed is very comfortable. Owners are very nice and responsive to any issues. We didn’t think there was a bathroom door but there is. It’s a pocket door that blends right into the molding. Perfect for two people. I would have felt cramped with more as it is an efficiency apartment. Only about twenty minutes or so to Two Medicine which we really enjoyed. Great stay and would definitely recommend.